This tour is designed specifically for travelers who want to get in touch with local people and travel of the beaten path. The journey begins in Antigua, where you will understand the meaning of this magical and captivating small city. You will have a brief view of the city and will continue visiting each town with a bilingual guide. Visit to Ciudad Vieja (second capital of Guatemala), a macadamia farm in San Miguel Dueñas, San Juan del Obispo, San Pedro Las Huertas and finally you will have time to weave your own souvenir in San Antonio Aguascalientes. The tour will start departing from your hotel in Guatemala City or Antigua. A good place to start a walk of this monastic town is the “Plaza Mayor” or the square which in the center has the “Mermaids Fountain”, then a visit to the “City Hall”, “The Palace of the Generals Captain’s”, and the “Cathedral” is advise, the fourth side of the square is occupied by souvenir shops, coffee shops, library, jewelry and others. We will continue our exciting day visiting the towns that surround this city. After visiting the center of the city, your guide will take you to the main towns around Antigua. During this visit you will learn about history, culture, traditions and more of the towns of Ciudad Vieja which was the second city founded by Spanish in Guatemala. You will also hear about San Juan del Obispo where we will visit the monastery of the first bishop of Guatemala, Francisco Marroquin, San Pedro Las Huertas and San Miguel Dueñas where you can find an organic macadamia farm where you will learn about many medical functions of the macadamia nut. Time for lunch at a local restaurant (not included). After lunch visit to San Antonio Aguascalientes which is well known for its colorful and nice handicrafts. 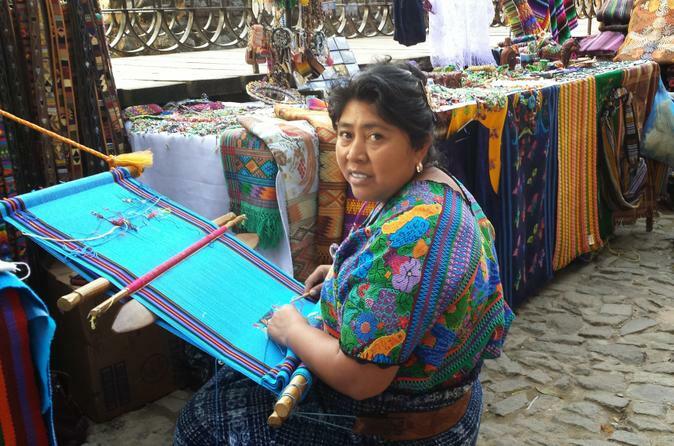 Visit a women’s weaving cooperative where you will learn about the elaboration of huipiles, a process done by hand using the ancient technique called “tejido de cintura” (tissue waist). You will have the opportunity to learn the technique and make your own tissue and bring it home with you as a colorful souvenir. It will takes about 2.5 to 3 hours. You can also learn in a workshop about the life of our artisans and see how a Guatemalan family lives. When finished, transfer back to your hotel.